The holiday season is officially here and for many of us, that means a lot of time will be hunched over in cars or on plains and indulging ourselves at dinner a bit more than usual. While we welcome this exciting and fun season, it does have our schedules and lives thrown a bit out of balance. In an effort to de-stress and unknot our achy bones, we have 5 Yoga Moves You Should Do While Traveling. All of these moves could be easily performed without a mat and with limited time and space, which make them perfect for this busy travel season. This is a great pose to help relieve the inevitable vacation digestive troubles and bloat. You can also rock back and forth for a little-added back massage. How to: Simply lie down, relax and inhale, placing your hands on your knees. Exhale, and hug your knees to your chest. Stay for five to ten breaths, and release your knees. Repeat this move a few more times. This one is great to relieve low back pain that can come from sitting uncomfortably for long periods of time. How to: Seperate your feet hip-width apart, bend your knees slightly, and bring your chest to your thighs. Fold Forward and grab opposite elbows and settle into this pose for a few minutes. The instant relief will astound you. This chest and kneck opening pose help to relieve stress and anxiety. The mild inversion also helps your blood flow, making you feel more energized. How to: Lie on the floor and bend your knees. Keep your arms beside your body and your feet flat on the floor. Press your hips up to give your chest a good stretch. 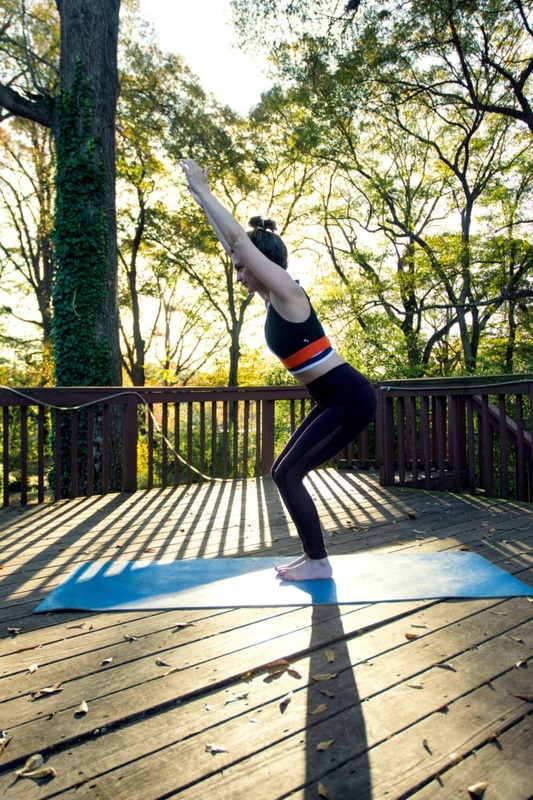 This pose lengthens and encourages mobility along your spine, massages the internal organs, and stretches the hips, chest, shoulders and upper back. YES, PLEASE. 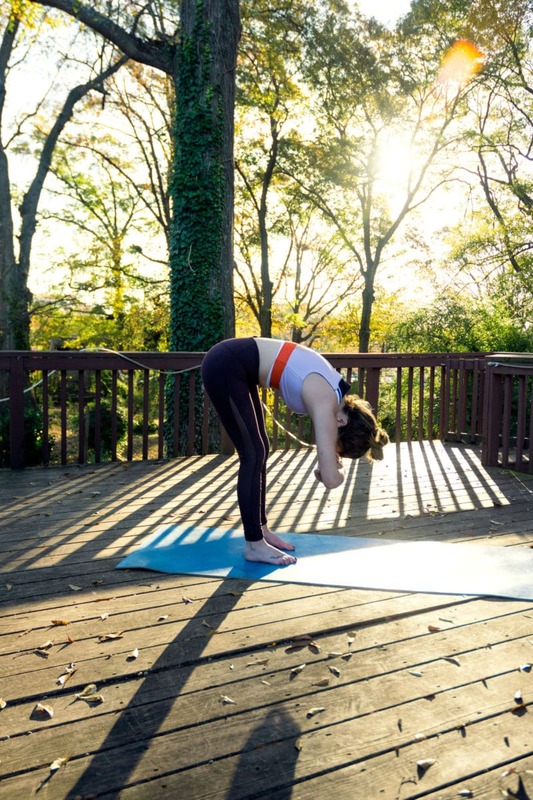 It is also a great counter stretch to follow up a backbend- like the bridge mentioned above. How to: Lie down, hug your knees and inhale. As you exhale, drop your knees to one side, using your hand to push them down gently. Then, turn your head and stretch your arms out. Stay for five to ten breaths. Inhale, and return your hands and knees to center. Repeat on the other side. This move is great for waking up the part of your body that don’t get a lot of blood flow while trapped in a seatbelt. This pose also opens up your chest and helps strengthen and tone your legs. How to: Stand with your feet together. Bend your knees like you’re sitting in a chair. At the same time, raise your arms up beside your ears. Try not to let your knees go over your toes. To get out of the pose, straighten your arms on an exhale. Then, rise to a standing position, and bring your arms down to your sides. Do you have any moves that help relieve the achiness that comes with traveling? Leave your comments below or tag us on social media. Don’t forget the tricks you can do to boost your immune system too!